“Occupy Wall St” and “Los Indignados” may have raised the banner of anti-capitalism in the West but for the last 2 months South African workers have reminded us what real class war is about. 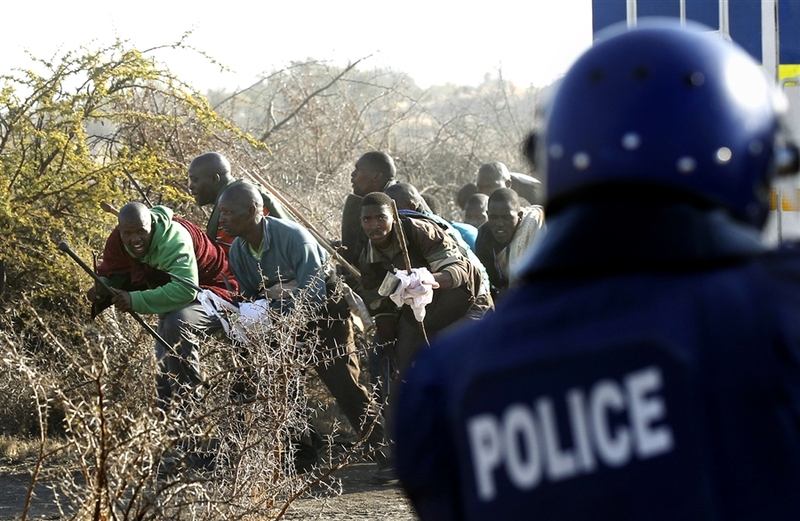 The Marikana Massacre of 34 miners shot by the police has unleashed a wave of (mainly) wildcat strikes. These began in the Rustenburg platinum mines of Anglo American then spread to gold, diamond and coal mines. These were followed by a wildcat at Toyota’s car factory in Durban as well as a “protected” i.e. legal strike of lorry drivers which is drawing in rail and port workers. Over 150,000 workers are involved. No wonder then that our prediction that the ANC would be invited by the white ruling class to save the system came true. No wonder that Anglo American were one of the first companies to support the ANC. Since then there has been a natural transition for anti-apartheid figures (like Cyril Ramaphosa the former head of the miners’ union into the boardrooms. After 18 years in power the ANC has produced a situation where, according to its own calculations, 9% of the capital of mining corporations is in the hands of black capitalists. The consequences for the working class have been dire. The urban underclass, surviving on welfare payments, has increased from 2.5 million in 1999 to 12 million in 2006! The South African mining companies made good profits in recent years from selling their commodities. But the collapse of the speculative bubble has hit the real global economy and profit margins are down. At the same time after two decades of near double digit inflation the workers are demanding a share of the wealth they created in appalling conditions. After 18 years of union collusion with state and management the workers of Marikana whose working and living conditions are “pure hell” took matters into their own hands. In doing so they have come up against the combined forces of capital, the state, and their “own” union federation, COSATU. They now face massacre (death toll now over 50), lock-outs, media lies, sackings and false promises but still the strikes keep on spreading. At the time of writing union leaders, in league with the management, are trying to persuade workers to come back to work (like gangsters they offer “protection” from sacking!) and allow them to negotiate their working conditions. But the management, in the face of falling profits during a global recession, are already preparing to pull their capital out. Some have declared the 22% wage rise at Marikana or the 4.5% wage rise (inflation is currently 5.5%) at Toyota as a victory. Compared with the past who can deny it? But as the ANC Government cuts interests rates so that the rand declines further (there is a world trade war going on and lower currency means you sell more) what capitalism might give today will go tomorrow. The workers have won much without much organisation but for how long? The real problem today is the crisis of the world economy. Everywhere capitalism offers only more misery and worse. The real issue is not to squeeze some crumbs from the system but to alter the system itself. But this requires a political programme which does not just deal with one country but the global system. It is a long road we have to travel but workers everywhere will have to come together to form a global political organisation which aims to get rid of capital, money, national borders, wars and ecological calamity has got to be the aim. The alternative is more massacres and a descent into barbarism. Marikana miners have made a start. It has to be built upon.